Do you ever stop, just long enough to wonder what life would be like if you lived every single moment. You know, In the moment? When I’m living in the moment, all here and nowhere else, it feels like that is how life is meant to be. In fact, it's how life really is. Total presence of mind, heart, and body. It feels like truth. It feels like soul. When I’m there, appreciation floods my system. I love snow for this same reason- It stops people in their tracks, it brings them together. Everyone finally has something to talk about, something to bring up to a stranger, to call and tell a loved one. "did you hear there is a big snow storm today?" They stop to catch it on their tongue, to take a picture, to hold each other a little more tight. Something about time stands still while it falls. As if it's dancing against the ground, telling it, stop, be still and enjoy this moment. I am smitten, giddy, wildly head over heels for these beautiful, euphoric moments where time stands still and I feel alive. You may have seen that beautiful watch on my wrist on my most recent pics- I can't tell you how much I love this beautiful timepiece. Its simplistic look is perfect for all my different kinds of styles. It adds a very unique touch to any of my outfits, whether it be classy, casual and even sporty. 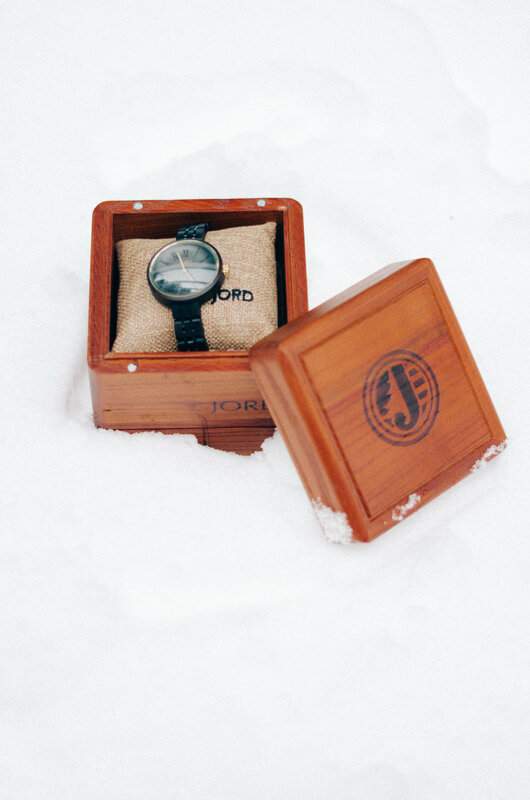 With that said, I've teamed up with JORD to give one lucky follower $100 towards my Cassia, Ebony & Sable watch or any other watch of your choice. Plus free shipping and free sizing. You also get 10% off for just filling out the form. How neat is that?! This giveaway will close 02/25/2018 at 11:59pm. So make sure to enter!!! "The value of a watch is not in being able to tell how much time has passed, but in being aware of the need to make that time count. Moments are bigger than minutes and your watch should tell more than time...We make our watches for people who don't just have somewhere to be, they have somewhere to go."